New details keep emerging that it wasn't just talk radio hoo-haws that pushed Twitterman into closing down government. North Carolina Congressman Mark Meadows had Trump's ear too and piled on. "Shut it down! Make 'em beg. The Democrats will break, and you'll inspire your base." A couple of weeks before Christmas, the Republican Party establishment in Congress thought it had agreement from Trump to pass a "clean" continuing resolution. Mitch McConnell acted on that agreement, passing the CR in the Senate. Paul Ryan was trying to follow suit in the House, when Anne Coulter, Rush Limbaugh, and (bless his heart!) Mark Meadows threatened Trump's masculinity. Mark Meadows leads the Freedom Caucus, three dozen of the most conservative Republicans, and he's had plenty of experience sticking his thumb in Leadership's eye. He precipitated the 2013 government shutdown. He regularly blocked reasonable deals engineered by John Boehner and forced Boehner to resign. He was then a thorn for Paul Ryan too. He and the Freedom Caucus could get away with it, because the Republicans didn't quite have the numbers to not depend on those 36 votes. "The Freedom Caucus’s mission often looked as if weakening its own leadership team served as big a goal as safeguarding its conservative purity" (Paul Kane). You notice that extreme instinct for self-immolation in the hardest conservatives: "Hurts so good to pull down the temple on our own heads!" But this land developer from North Carolina, Mark Meadows, who has no ear for politics, nor head for it either, cannot be embarrassed when his loose-cannon partisanship knocks a hole in the boat. Meadows apparently spoke to DJT more than once during the December showdown over shutdown. He gave his last pep talk via phone on December 20th: "Now's the time for good men to stick to their guns -- before the Democrats take control of the House. Conservatives got your back, here and across the country! Shut it down!" So Meadows and Trump got what they thought they wanted, a display of overwhelming strength. Only this was display with no real strategic planning behind it, other than the vaguest hope that Democrats would cave. They didn't. But Trump did. Genius! Is Trump still calling Meadows for advice? Meadows is cooked. Even some of the Freedom Caucus finds him embarrassing. He staged a showy speech on the House floor day before yesterday, "angry about the wording of a resolution condemning federal government shutdowns," and he forced a vote on adjourning the House in protest. It received just 14 votes. Hilariously, Meadows is bragging to reporters that he's "on top of it." He claims now that he foresaw the Democrats taking the House at least six months ago, and that he began preparing for it by reading classic literature "about how coalition governments work in countries with parliamentary systems," etc. (like you're believing this scholarly tale, right? 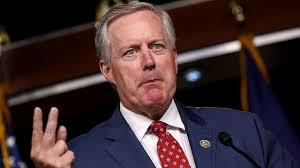 ), and he claims he has a master plan for defeating the Democrats which may involve fake beards: "He promised that the Freedom Caucus is coming up with ideas to rebel against Pelosi’s majority, to upend the place in a similar style, if not the same outcomes, as its rebellious days in the majority." In his favor, Meadows sports the pleasant demeanor of a Ken doll buzzing on caffeine. But a brilliant political tactician he ain't.